The Irish people have been viewed in a negative light by people of other nations, particularly Great Britain, for centuries. The political cartoon above was drawn by Thomas Nast, known for anti-Irish cartoons featured in Harper’s Magazine. 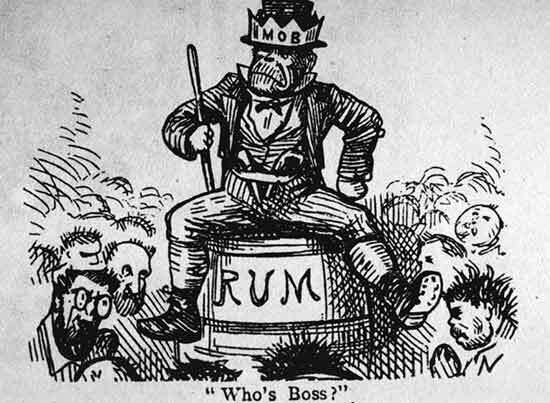 This particular cartoon mocks both the Irish mafia and Irish immigrants in general. The ape-like man is often used in anti-Irish political cartoons, implying that they are uncivilized savages. He is sitting on top of a barrel of rum, implying that alcohol is the foundation of their lifestyle and they are dependent on it. However, he is wearing finer clothes which suggests that he is putting on a costume and pretending to be something that he is not, a civilized man, and therefore cannot be trusted. All of these qualities portrayed in this particular cartoon confirm the degrading Irish stereotype which originated with the British. The picture painted of the Irish by the British was an uncivilized, filthy, uneducated, drunkards. Irish people immigrated to America in hopes of escaping the insulting labels placed on them; however, the stereotype of the Irishman trailed closely behind wherever they went. The Irish were the most impoverished group of immigrants in the United States, the lowest of the low in New York City; which did not help to disprove the British stereotype (Anbinder 149). In response to facing the prejudices from Americans, Irish immigrants decided to band together and support each other and have a sense of unity among themselves . They formed social clubs, mostly just for men, in order to bond over their common troubles in life such as living conditions, economic situations, and discrimination by Americans. These clubs eventually evolved into some of the first gangs of New York City. The Americans greatly disliked the Irish for several reasons, but mostly because of the inaccurate stereotype that they knew so well. Their information on the Irish was mainly from British sources and , therefore, biased. They did not want to associate with the Irish because they believed that they were superior to the immigrants (Harriot). The Irish were viewed as “the other”, not assimilating into American society well due to the insulting stereotype. 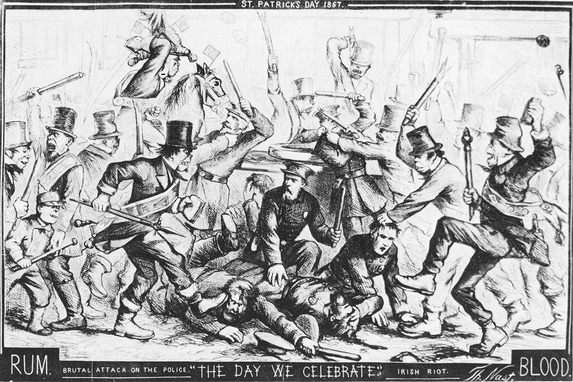 This is a cartoon drawn by Thomas Nast of rioting at the St. Patrick’s Day parade in 1867. This was not the first brawl between the metropolitan police and the Irish and it would not be the last due to cultural and political differences. Although conditions have improved some, immigration is still a heated topic that is heavily debated today. Even today immigrants are still viewed as dangerous and the “other”. The United States faces the same issues in the 19th century as it does today; but these debates have been going on for centuries and probably will never come to a conclusion. In both time periods there are people who fear immigrants are taking too many jobs, who believe immigrants are corrupting society but politics in particular, which is what Thomas Nast believed (Herb), and many more negative associations with immigration. However, society generally has become more accepting of foreigners as opposed to the 19th century. Anbinder, Tyler. City of Dreams: the 400-Year Epic History of Immigrant New York. Mariner Books/Houghton Mifflin Harcourt, 2017. Harriot, Michael. “When the Irish Weren’t White.” The Root, Www.theroot.com, 17 Mar. 2018, www.theroot.com/when-the-irish-weren-t-white- 1793358754. Pages, The Society. “Irish Apes: Tactics of De-Humanization – Sociological Images.” Sociological Images Racializing the Abortion Debate Comments, thesocietypages.org/socimages/2011/01/28/irish-apes-tactics-of-de- humanization/. “The Day We Celebrate · HERB: Resources for Teachers.” Herb – Social History for Every Classroom, herb.ashp.cuny.edu/items/show/641.